Taoiseach Leo Varadkar has officially opened Microsoft's new €134m campus in south Dublin. The 34,000 square metre purpose-built building is now home to the company's 2,000-strong Irish workforce. 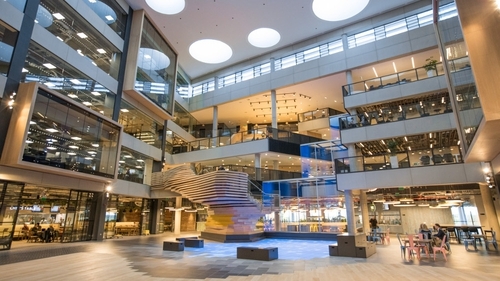 Microsoft's Managing Director for Ireland Cathriona Hallahan said the building is the physical manifestation of the cultural transformation that the company has been going through in recent years. "Really since Satya Nadella took on as CEO of the company and redefined our mission, which is to empower every individual and organisation on the planet to achieve more," she said. "What we are doing in this building is bringing all of the teams together, whether it is engineering, or operations or digital sales, and helping them to innovate in this new culture of one Microsoft." Ms Hallahan said it was a demonstration of Microsoft's commitment to Ireland for the long-haul. "We celebrate 33 years here in Ireland this year," she said. "I think this building epitomises the future for Microsoft and it is us opening our doors to our customers, the community, to have an impact on society as a whole." She added that by demonstrating how all the different functions in Microsoft can fit together in one place, Microsoft Ireland is optimistic that the company will continue to invest in its operations here. On the ground floor a large open area called the Dreamspace will be used to teach young people about integrating science, technology engineering and maths into their learning and to imagine what the future will look like. Microsoft has set a target of bringing 100,000 children from fifth class up to transition year, along with their teachers, through the Dreamspace over the next four years, beginning in April and two dedicated members of staff will work on the project full-time. The building's "Harbour" entrance area on the ground floor leads to a large full height atrium area filled with natural light, where there is a "digital lake" - an area of blue LED floor lighting that resembles water. There are no offices - instead teams sit together in so-called "neighbourhoods" - with different operational areas mixed up with others across each floor in order to encourage interaction. The building has over 80 meeting rooms, "focus group" rooms and also has space to seat 3,000 people along with a theatre-like Technology Centre. Internet of Things technology coupled with data analytics are being used to gather data about the building's use and there is 350km of IT cabling running around it. Other features include a gym and fitness room, a yoga studio, a nail bar, massage room and a fully equipped music room. The ground floor also has an extensive canteen, bakery and barista counter. Overlooking Leopardstown Racecourse, One Microsoft Place is the size of two Croke Parks and the height of five double-decker buses.